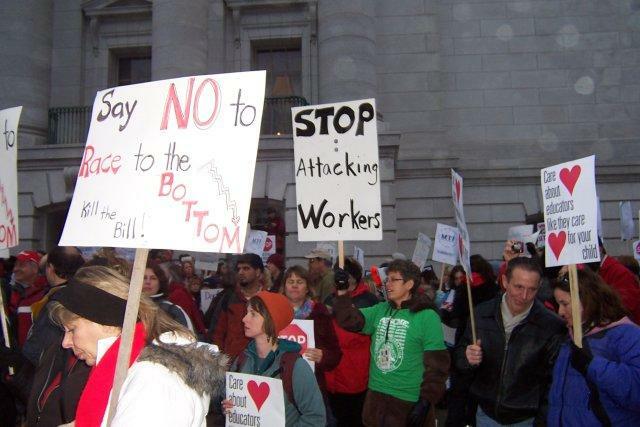 In 2011, protesters swarmed the state Capitol to protest Act 10, the law allowing public workers to opt out of unions. Conservatives are pushing to enact the same rules for the private sector. Unions in Wisconsin are bracing for another battle. On Monday, a conservative activist launched a group called Wisconsin Right to Work. Its goal is to change state law so that private-sector workers cannot be forced to join unions. The fight back in 2011 was about public sector unions. Massive protests took place in Madison as Gov. Walker and Republicans passed Act 10. It ended collective bargaining for most public workers and lets them opt out of paying union dues. Now, conservatives are eyeing the private sector. “Our effort is really just about getting freedom in the workplace for workers,” Executive Director of Wisconsin Right to Work Lorri Pickens says. Under right-to-work laws, private-sector employees cannot be forced to join unions or pay dues as a condition of employment. Pickens says whether workers join a union or not, they should have the same benefits, rights and protections on the job. Sheila Cochran has a different perspective. She leads the Milwaukee Area Labor Council – a group of more than 140 public and private locals and unions. “For those of us who pay our union dues and pay for representation, I’m not paying for freeloaders," Cochran says. "And that’s what right-to-work does. It allows people to get representation without paying the freight." Cochran says organized labor has been expecting a new push for right-to-work legislation in Wisconsin and is prepared to fight it. She does not believe the motivation behind right-to-work legislation is to free workers, but rather, to take more from them. “Break unions, lower wages, lower benefits, make more money,” Cochran says. It appears the arguments might have their day in Wisconsin. The new Wisconsin Right to Work group intends to pursue the issue. “Our first order of business will be to begin the dialogue with opinion leaders and policymakers and citizens throughout Wisconsin and see where we are,” Pickens says. Pickens previously led operations in Wisconsin for the national group, Americans for Prosperity. Conservative billionaires Charles and David Koch are AFP’s major backers. During his re-election campaign, Gov. Walker did not say whether he would sign a right-to-work bill. He told the Milwaukee Journal Sentinel that he supported the idea back when he served in the Assembly – but now, it’s not a priority. “It’s not even just about whether I think the policy is good or bad, it’s about the tenor and the tone of the Legislature and what it means ultimately to the state as a whole," Walker said. "So particularly, in that particular issue, and any other substantive changes to Act 10, I just think that opens up a whole other can of worms out there." Walker says rather than changing labor rules here, his focus is making sure Wisconsin has a business-friendly tax and regulatory climate, and a prepared workforce. While right-to-work has been a hot topic in Wisconsin for a number of years, lawmakers who’ve hoped to advance the idea failed to snag enough support. On Monday, Assembly Speaker Robin Vos said he’s long supported right-to-work and looks forward to discussing the benefits of such a law to Wisconsin. A spokesperson for Senate Majority Leader Scott Fitzgerald says he’d like to talk Gov. Walker and GOP leaders before commenting. Do Right-To-Work Laws Help Or Hurt The Economy? Tuesday marks the third anniversary of Gov. Walker signing Act 10 into law, restricting public unions.